This is the first package of the Warzone SP Series. 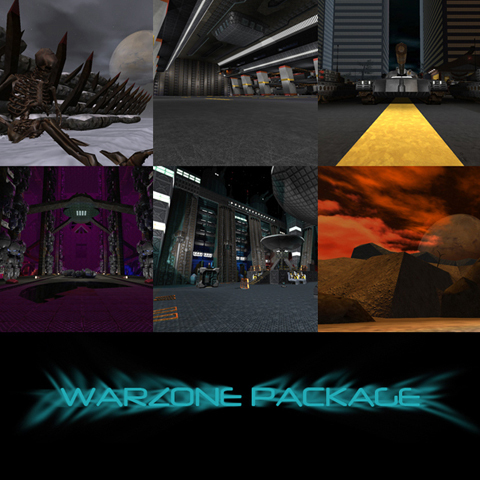 It contains Chapter 1 of the SP Series and several Warzone-Themed multiplayer maps. SP: Play as SGT. [You!] from the Galactic Federation's prestigious Alpha Company and take on the Trident Armada in the first 4 plot lines of the Warzone Series. Multiplayer: Frag your enemies, frag your friends, frag your friends' enemies in these 5 Warzone-Themed multiplayer maps! Avalanche: Fight in the frozen valleys used by the Federation as Training Grounds for new recruits. Beware of the minefields and spike traps! A medium-sized map for 6-20 players. Hangar: Fight for the largest storage facility of the carrier, the FSS Renalto, for control of (you guessed it) Hangar-02. A large map for any multitude of players. Metropolis: Fight during the invasion of the beautiful city of Vehemence to fix the rivalry between Red Inc. & Blue Ltd. A medium-sized map for any group of players, 6-20 players. Piston: Fight in the bowels of this abandoned Chlyth golem factory to unlock its secrets! A small map for a tight group of friends, 2-10 players. Sector1: Long after the Trident counterattacks on Chy-Ceti-09, Outpost Garand still has enemies to deal with. A medium-sized map for any group of players, 6-20 players. This will allow you to use elevators. Hey, could you upload this to something like http://mediafire.com or another site that I don't have to sign up for to download? Content revised & problem has been fixed. The multiplayer maps have some nice details and vehicles in them, but their layout and gameplay really isn't that great. But the singleplayer campaign! It's the longest campaign i've seen so far in cube and i actually made it to the end without getting stuck (took me like 3/4 of an hour!). I really liked all the different locations (desert/ice/space-station/...), the storyline and especially the last part where it was up to the player what mission to do first. You also used many sounds which improved the atmosphere a lot and had some cool special effects like the flight in the spaceship, the slow-mo shooting or the nuke in the end. But even though you created some very nice details, a lot of the geometry and texturing could have been done way better. In many cases the texture doesn't quite fit the geometry and some details are very repetitive. Also the monster and pickup placement isn't that balanced. You sometimes run out of ammo and are stuck with your pistol or carrying so much that you have to leave some pickups behind, both shouldn't happen too often. And in some places there are far too many monsters attacking you at the same time (in the hangar for example) and i'm not sure if the campaign is actually possible without dying, what it definitely should be (in the arenas in the first level you where kind of fall into through the respawnpoint you have no cover at all and are being attacked by lots of monsters). I'm looking forward to an update! Thanks for the review! Metropolis & Avalanche were complete revamps of my first maps so I expected them to be terrible. Ch. 2 is underway & I will take your advice into consideration when making these new missions! Oh my, I haven't seen a single-player map in the entire time I've been a member of Quadropolis, I think. [admittedly not that long compared to most members] When I have time to check this out, I give my opinions, but I'll say already that I'm impressed at the amount of work you must have put into this series of maps. Seems interesting, such large package. Too bad not every map gets the attention it may deserve because of that. The packaging isn't bad, but adding sub-folders for maps isn't necessary (even the intention is probably good). Please read about README's in the packaging-guide. I've once though about such theme also, except the snow part. It's pretty refreshing compared to the default space-maps. There have been used a lot of texturings on the details, but only a few apart from that. What about some rocks also? Mountains are never completely covered with snow, but more like on horizontal surfaces (which makes me point a little to add some more vertical surfaces to the mountains as well). The geometry is way too high to be actually playable in multiplayer. 470k of wtr is definitely not necessary to make it playable or look good (it doesn't work like the more wtr you use, the better a map looks =P). The lighting is fine. It has been kept simple like it should. The details look really good and show you've putted a lot of time in the map. But they are pretty much clustered. The idea of the sounds is very nice though. The clipping isn't bad on details, but it is on the layout. There is no reason what so ever why you actually die when you try to access the top of certain mountains. People literally drop to death. The layout of the map is pretty original, but very flat. The only cover which is being provided are certain blocks, tanks and thin trees which all seems to be positioned randomly (The map actually seems more like a conceptual showroom of details like tanks and so than actually a gameplay map. So try to add more cover as like rocks, crates (where the hell did those blocks come from any how and stocking supplies makes sense, doesn't it?). The position of the flags is really killing the gameplay of the map. In a mode like instactf, you don't even have to guess someone will be camping on the flag while standing inside the vehicle because there is plenty of shelter (the cabin makes sure of that). In a mode like classic ctf or efficiency ctf, people which try to defend will get tossed away by rockets or grenades simply because they have about zero chance to avoid the impact of the explosion. The pickup placement is bad. having 16 bullets around while only having 3 grenades, rockets and riflerounds and also 4 shells isn't providing a lot of variety. Also letting cartridges spawn near the flag isn't helpful either, as people spawn with 40 pistol-bullets already. So try to replace those cartridges for something like grenades to get a better variation in gameplay. I would also add more pickups as about 32 places to gather a bit of ammunition is very low for such sized map. Very nice looking map, but a flat and boring layout. The gameplay is pretty one-lined as well. Very risky theme, as it shows off. I'll talk more about it the next couple of points. Same story for this map as Avalanche, it contains way too many wtr. 706k of wtr really eats your fps away for most of the computers nowadays. Keep in mind Cube Engine 2 is designed to create indoor arena-like maps from origin, not complete landscapes with details where every millimeter matters (we got mapmodels to do that job). You can better use some geometry and make that flat from pushing it together side-ways than actually stamp it into the floor. If you put wireframe on you'll see they are big chunks of triangles (about 35k, you could have used those traingles to create the map dirtndust and still would have left). The lighting isn't that great. It's all just plain white and sometimes missing light-sources. Most light-sources aren't realisticly emitting the amount of light which often has been generated due lightmaps. The detailing is more balanced in this map, but less outstanding. A lot of details also has been used quite often. The clipping is fine, but that's more due it's layout than the actual clipping. The layout is simply bad. It's just 1 big room with 2 higher floors where a few crates and planes are putted on. The gameplay isn't much better. The same story counts for the pickups as on Avalanche. The gameplay of Sauerbraten isn't consisted out of the machinegun only while the rest actually doesn't matter. it consists a certain balance between all weapons, armours, health and powerups. You can really see way less effort has been spend on this map as on Avalanche. I won't say much about this map as it lacks all what already has been said. It also uses a lot of details which already were present in the previous maps. The sound at some fire seems to be very odd, as it's not burning rather humming. A lot of details lack noclipping also. The lighting isn't that great also. Setting fullbright-mode on in edit-mode actually makes the map darker in certain rooms. This actually seems to worst map. It contains 1083k of world-triangles while the detail consist out of just 1 design of a robot that has been pasted around multiple of times. If the robot wouldn't be there, I'm pretty sure all what is left is about 80k of wtr at max. It doesn't matter if you actually see a certain detail, as long as players think that it appears in a certain place then you've reached the goal. Take for example those guns which you've made. They look lovely but they won't add more value to the map. If you would have putted a texture which says "ammunition" on a door (which replaces the guns), that brings the very same message to the player as those guns. Even putting only 1 gun in that closet makes enough clear. It still contains the very same mistakes as in all previous maps. You can clearly see that you've got a certain knowledge of pushing and pulling cubes, texturing surfaces. But every map also shows off that you still have a lot to learn about lighting, flow and gameplay. But let's move back to the map. Every map has nice details, but they all are way too heavy or used too repetitive. All maps lack a decent layout and gameplay. I'll rate 5/10 so far as they are intentionally made to play on. I've view the SinglePlayer maps another time. I'm still a newb working out the kinks. :P Thanks for the review! Other maps I haven't looked at yet. It's very nice to see some SinglePlayer map again, but I noticed the next couple of points which could be improved. You haven't thought about the fact that people can easily trickjump out of the maps. This gives them the advantage to end the level way earlier and easier as they should. The player should be guided better in all of the maps. There are a lot of situations where you are just left alone without any instruction. - Don't mess with gamespeed. It's very annoying to be forced to slow down like that and wait till a next message appear after 5 seconds. It's not like something happens in the mean while. If you really want to tell a story, add voices instead or just display so without any change on the gamespeed variable. - Don't add a panel which you've got to guess the code from to continue your journey unless the code is explicitly shown before meeting the panel. - Don't bind commands. It's something which never should be done unless it's being notified. But even then, it's preferable not to do so as it takes quite a lot effort to manually change the bind to something else when you actually just want to play so. - Don't put death without any reason. It breaks the realism and annoys a lot when you've just managed to stay alive with only a few health left and then suddenly die because there is some wall of death-material. Thanks for the SP critique! Nice to see some spoilers, but that doesn't improve the gameplay ingame actually. You still aren't guided well through the map in any of the warzone-maps. I'll change that with the next package. I might use capture meter particles as jury-rigged waypoints. It's supposed to simulate confusion & the reality of unknown territory. How do you combine skyboxes like that? Do what Skiingpenguins posted, then change the clouboxalpha variable between 0.0 - 1.0. (0.0 being 100% transparent, 1.0 being 0% transparent) Most of my maps with a cloudbox use an alpha of 0.4 - 0.7. You may also want to use cloudclip (0.0 - 1.0) so your cloudbox doesn't appear to abruptly end over your skybox. People have already highlighted lots of problems and given their bit of criticism, so I'll try not to repeat anything. However, I'll start by saying that the SP maps are much better, and if/when you release more, just focus on the SP maps and don't bother with any multiplayer maps in the same release. For whatever reason, when I play the single-player maps, none of the elevators work at all. This makes it very difficult to complete the maps. I'm playing on the vanilla version of Collect edition (No mods or extra stuff added to it) so I don't know what the problem is. Also, I can't figure out how to open the big door in the first room of Warzone 2 (the ice one), but I'm guessing I'm just overlooking something on that. This is IMO the best single player map, however it definitely should not have any consideration for CTF mode. being able to jump down from one roof to the other is incredibly unbalanced, and also gives one side much easier access to the healthboost. Additionally, the "elevator" to the bottom of the shorter tower has insufficient cover, allowing the other team to easily camp it from their side of the bottom of the map. This map specifically is much too narrow. Every passage is completely constricted, and the rest of the map is wide open with little to no cover and very flat and boring. Those are the only specific things about the multiplayer maps people haven't said yet. Overall, though people have said it before me, there is very nice detailing (too much in a lot of instances) but bad flow and lighting. 8/10 for the singleplayer if everything works, but 5/10 for the multiplayer maps. Elevators: Press B to open the elevator control console, right = up, left = down. Note that this only becomes active once you've entered the assigned trigger(s), which I have placed so you ALWAYS run through them to get to an elevator. Warzone2 first door: activated by finding both Federation Infantry Helmets, they're not very hard to find.